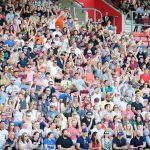 Crumlin Road Gaol, Belfast – 1000 fans packed the arena for the Ultimate Strongman Master World Championship 2017. It was the 4 Times World Strongest Man Zydrunas Savickas of Lithunia who laid down his marker early, winning the first event – the Truck Pull. The technique that won him all his major titles helped him beat the rest of the field with a winning time of 24.75″ which was over 2 seconds faster than the reigning champion Vidas Blekaitis. The reigning champion placed second in this event which is pitching distance of the greatest of all time with 5 events still to go. The second event was the Duck Walk for Distance. This event tested all of the Master’s grip and pure determination to carry the Duck as far as possible. All of the Masters still had good grip come 20 metres but once they got over this mark the pain start to set in and the skin started to peel off the hands. 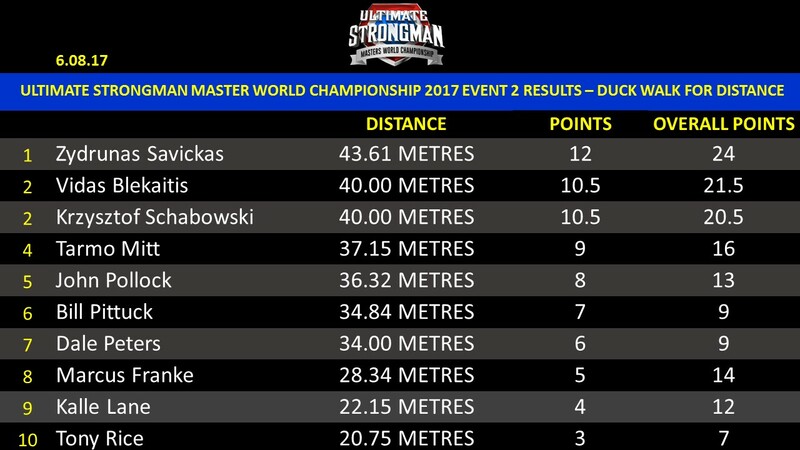 A number of Masters dropped the weight before the 30 metre mark but it was who put out a message that he will not beaten in this event. 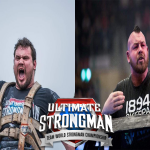 However, the battle was in the last heat with Zydrunas Savickas, Vidas Blekaitis and Krzysztof Schabowski. All of them pushed each other to the absolute limit with Vidas and Krzysztof getting joint 2nd with 40 metres but Zydrunas Savickas was able to make the final turn before dropping the duck to be awarded 1st place with 43.61 metres. This meant that Zydrunas Savickas was leading the reigning champion by 2.5 points going into his favourite event the Log Lift for Maximum. The third event was the Log Lift for Maximum. 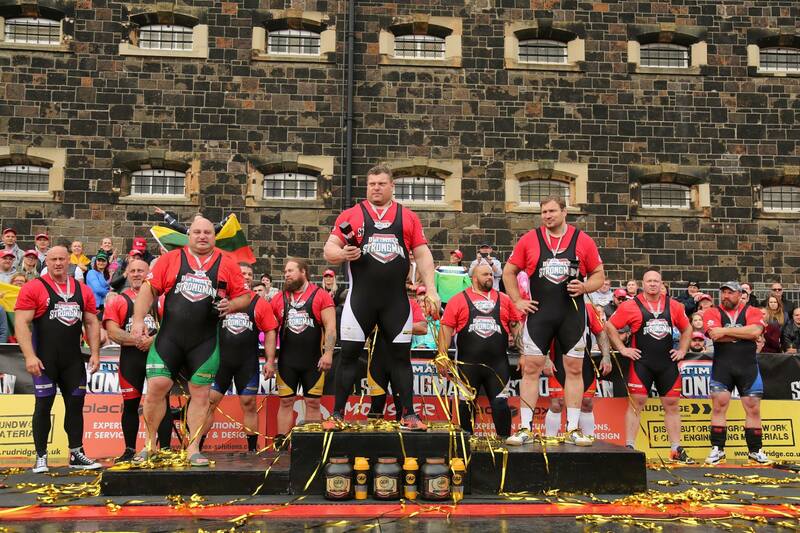 This event over the years has been dominated by Zydrunas Savickas and he holds the World Record of 228KG. Nearly all of the Masters made the opening weight of 120KG but as the weight started to incease to 130KG and 140KG there was only 3 men lift. 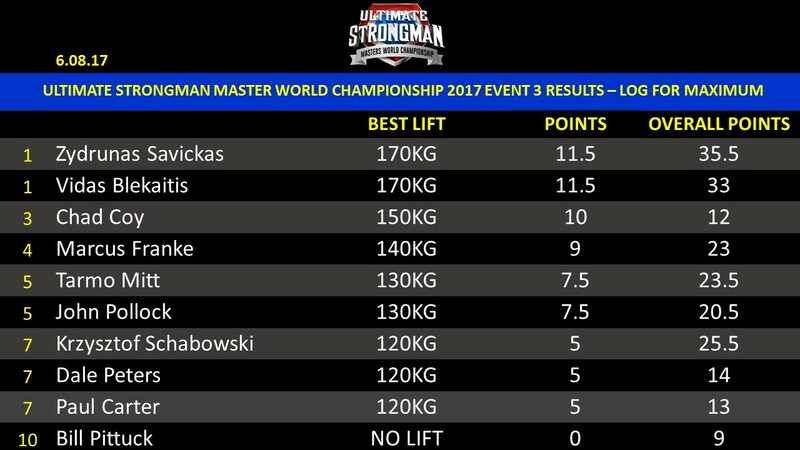 Chad Coy of the USA kept up with the rest of the field by pressing an impressive 150KG but this was made to look easy by Zydrunas Savickas and Vidas Blekaitis. However, Chad could not press 155KG which would have been a PR for him. This meant that the weight was nominated to 170KG which both men pressed successfully. The weight increased again to 180KG which Vidas could not lock out due to an injury scare and Zydrunas could not fully lock the weight out to secure the win. 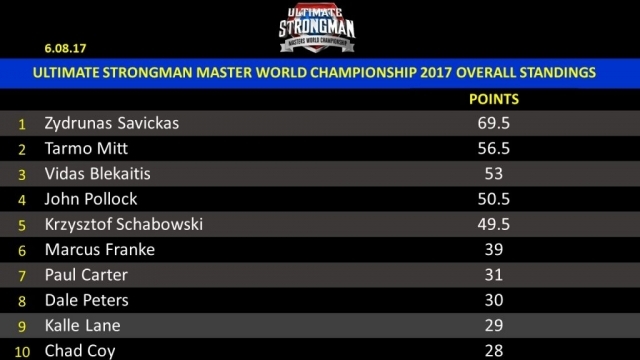 The points were shared and Zydrunas Savickas was still leading by 2.5 points at the halfway stage. The fourth event was the fan favourite Stones of Strength. This event seems never to disappoint with all of the competitors giving it there all. John Pollock of Scotland had an amazing performance by putting all of the stones onto the barrels in a time of 52.99″. 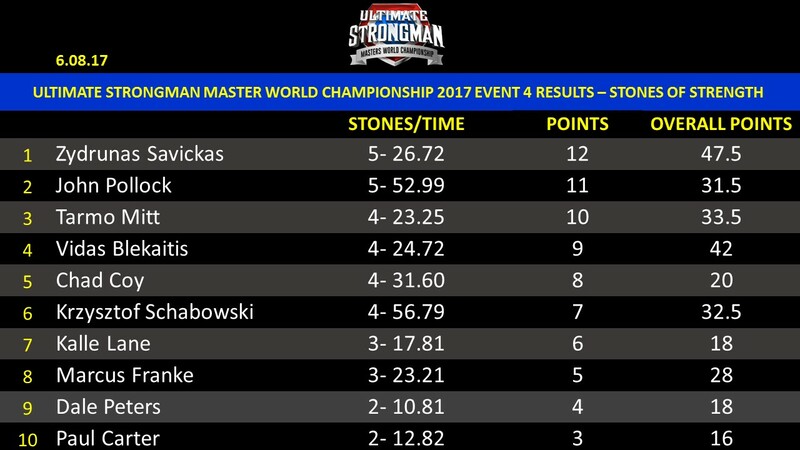 However, the greatest of all time Zydrunas Savickas won the event by being the other man to finish all of the stones in a time of 26.72″. Tarmo Mitt of Estonia showed his consistency by placing third and it was a disappointing performance by the Master World Champion Vidas Blekaitis with 4 stones in 24.72″ This meant that he was 5.5 points off the lead with 2 events to go. The fifth event was the Giant Tyre Flip which causes so much drama with the competitors as the technique needs to be perfect to keep a continuous motion. Zydrunas Savickas and Tarmo Mitt were head to head and this was great to watch but it was Zydrunas Savickas who pipped the Estonian at the line with a time of 32.21″. 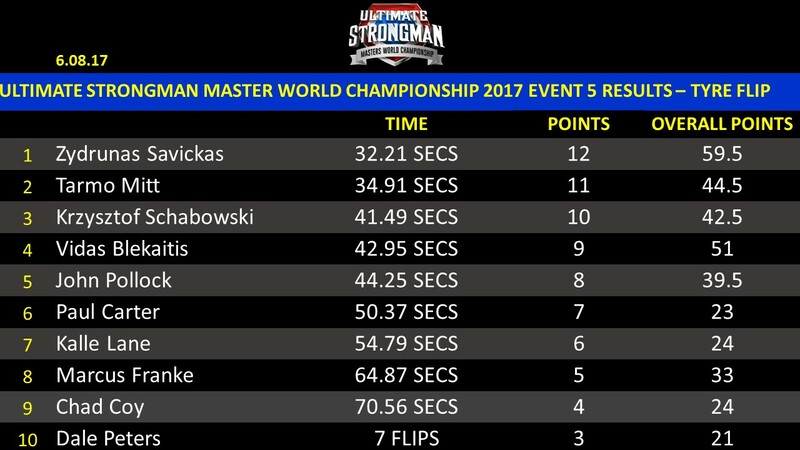 Vidas Blekaitis was losing site of his fellow country-man with 8.5 points splitting the two men going into the final event. The final event was the Flag Hoist. There were 8.5 points splitting the leaders but Vidas had a lot of work to do with Tarmo Mitt 6.5 points away. 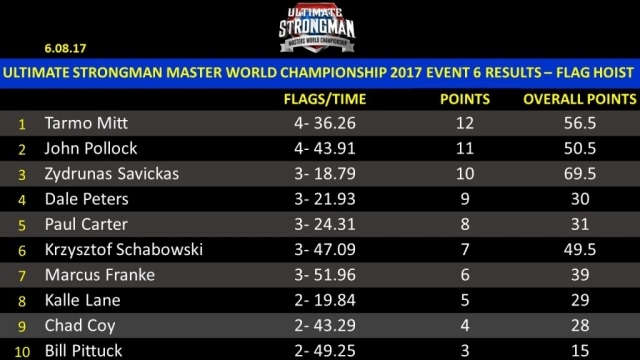 Tarmo Mitt secured the win in this event with 4 flags in a time of 36.26″. 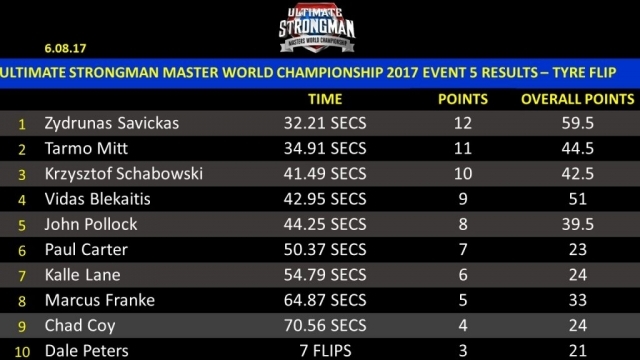 Vidas Blekaitis seemed to be carrying an injury in this event and could only lift one flag in 18.81″. This meant Zydrunas Savickas knew what he had to do and he lifted 3 flags in a time of 18.79″. 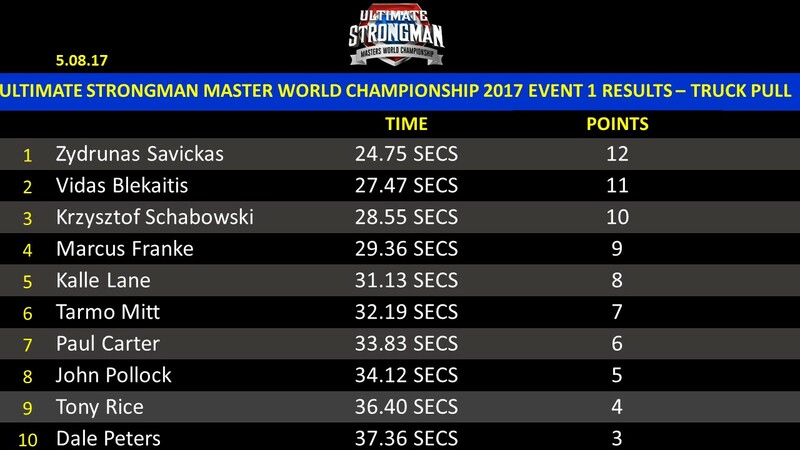 This meant that Zydrunas Savickas was the new Ultimate Strongman Master World Champion. Tarmo Mitt placed second and the former champion Vidas Blekatis finishing third.